The John & George Hotel is situated above the bay in the old part of Tolo, an old fishing village with a beautiful beach on the east coast of the Peloponnese. Tolo offers every kind of watersport plus a great variety of bars, discos, tavernas and other family-run businesses which give the place a distinctly friendly atmosphere. 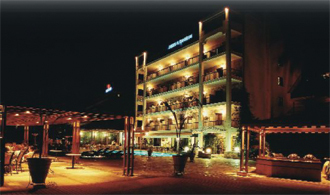 The hotel is within easy reach of major archaeological and historical sites such as Epidaurus, Mycenae, Delphi, Ancient Olympia, Corinth and Mystras. The comfortable family-run hotel has 56 rooms and 4 apartments with all modern amenities such as bath/shower, WC, TV, telephone, air-conditioning, private balconies with magnificent views, radio and hairdryer. 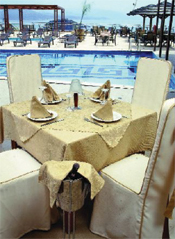 The well-stocked bar and the dining room are immediately accessible from the swimming pool. There is a lift to all floors. The hotel offers windsurfing and BBQ parties, while guests can enjoy one-day excursions to some of Greece’s most famous sites as well as boat trips to the beautiful islands of Hydra and Spetses. The hotel offers ground floor halls fully equipped to cover all types of conferences and events ranging from 25 to 550 persons. 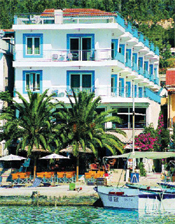 The Dolfin Hotel is also situated in the old part of Tolo. Refurbished in 2000, the hotel offers comfortable guest rooms with all amenities, including bath/shower, WC, bidet, air-conditioning, balcony, telephone, radio and hairdryer. Self-catering studios are also available. Most of the 33 rooms have a view of the sea. The friendly bar, just 10 m. from the beach, is adjacent to the dining room and easily accessible from the terrace. A lift in the reception area provides easy access to all floors. The Bellos Studios are situated in the centre of Tolo, just 200 m. from the beach and 80 m. from the shopping centre with supermarket, bakery and other stores. Refurbished in 1998, the building comprises 15 studios on three floors. The studios are ideal for two or three persons and each one has a private bathroom with shower, a fully equipped kitchenette and a balcony. Some of the studios have air-conditioning. Enjoy the unforgettable experience of a cruise from Tolo to a remote islet or deserted beach. A great opportunity for sea, sun and fun as the skipper prepares a delicious meal.